Finances are one of the biggest marital stressors. 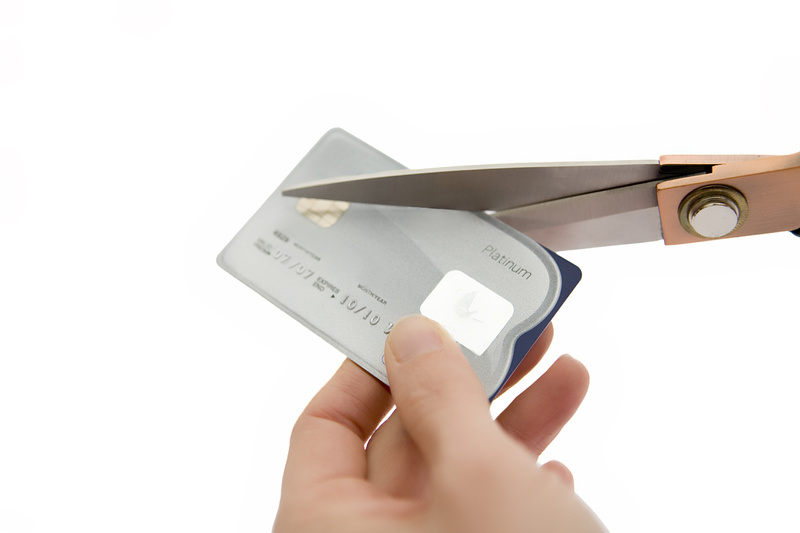 The Washington Post recently reported that the recent recession added financial stress to 29% of marriages. A silver lining is that one-third of couples worked harder to save their marriages, partly because they couldn’t afford to dissolve them. Of those who “redoubled their marital commitment,” more than half reported a very happy marriage. Since so many are struggling with financial worry or stress, I asked Brad Chaffee of Enemy of Debt to tell us how he and his wife dramatically improved their financial life–and ended up improving their marriage. Brad also asked me to share how 9 Tips for Financial Bliss in Marriage on his blog today, so give that a read. Thanks to Brad for his inspiration and insights! Brad Chaffee founded Enemy of Debt in 2008 after starting his very own debt-free journey. He wanted to motivate and inspire financial discipline by focusing on key behaviors and truths that would help others with the same process. In 2008, Brad and his wife grew tired of living paycheck to paycheck and living under the stress of being more than $26,000 in debt. Through dramatic action, they eliminated debt from their lives in a mere 18 months and plan to never borrow money again, for any reason. Brad has agreed to answer some questions for married couples who may have financial stress in their lives. Q: Brad, when you say you eliminated all debt from your lives, do you include even mortgage debt? How do you feel about families having mortgage debt? There are some financial advisors who say paying off the home early takes away a useful deduction. How do you respond to that? A: We are currently in the process of selling our house so we’re not “completely” debt-free yet. As Dave Ramsey would say, we’re “debt-free, except for the house.” People always tell me it doesn’t make sense, because we will just have to go out and get a mortgage down the road if we want to own a home. Not true. We are going to save and pay for our next house using the 100% down plan. We are perfectly okay with the fact that it means we will be renting for about 5 years until that day comes. Too many people make the mistake of declaring something impossible because it might be harder to accomplish. I would even argue that taking the easiest route to acquire something is the reason people find themselves struggling with debt in the first place. For us, being debt-free is worth the sacrifice and the extra effort. As far as not paying down the mortgage to keep the tax deduction. I think Dave Ramsey debunks that myth with this table found in Financial Peace University. 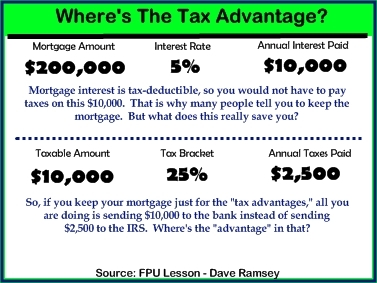 A tax deduction is never a good reason to NOT pay off your mortgage. What about all of the extra interest you end up paying as a result? Does the deduction justify paying more interest than you would if you paid the house off early? I think not. Pay down the mortgage! Q: What are the four most important steps you took to get out of debt? A: Deciding not to borrow anymore was the key step in getting things started, but I think the real journey started after that. I would say team work and communication, selling everything we thought defined us, saving an emergency fund, and maintaining a high level of intensity through it all, were the four most important steps. The most important thing was to begin the communication process and realize, together, our mutual goals and desires were ours together. That led us to a place where we could agree on what we were willing to do to get out of debt, which for us, included selling our “stuff”. That provided some momentum and allowed us to save $2,000 in the first two months. Finally, maintaining a level of intensity was important because it helped us reach our goal much faster. One of the most overwhelming things about paying off debt to most people is the time it takes them to do it. Why not benefit from doing it faster? Q: What was your biggest obstacle to gaining control of your finances before making this decision? A: The biggest obstacle for us was realizing that our spending habits were the very reason why we ended up where we were. It was hard because that meant we had to face our decisions and habits head on, and the truth really does hurt sometimes. That’s where my tagline for Enemy of Debt came from; “where behavior meets reality”. The budget helped us overcome that reality by enabling us to see the truth of our situation on paper. A budget does not lie. Q: Did you increase your income as part of your solution, or did you change your lifestyle. Many people who live paycheck to paycheck feel they cannot change their situation until their income increases dramatically. A: I would say we did both. During the process my wife graduated from nursing school, which naturally increased our income, but we also bought and sold stuff using eBay to increase it as much as we could. The mistake most people make is accepting or believing that they cannot increase their income. There is always something you can do; it’s often just a matter of what you are willing to do to make it happen. Personally, I feel the word “cannot” is a person’s biggest problem. If you believe you cannot, then you’ll never try because you’ve already determined it to be impossible. Q: What is the most important thing you gained from changing your life situation? A: I would say that the most important thing we gained was a better sense of unity. Better communication started the process, but it wasn’t until Financial Peace University that we took it to the next level. Dave Ramsey taught us that our marriage was the definition of team. A team doesn’t win because one person did all the work; it wins because of the collective effort of everyone involved. Most marriages usually have a “designated hitter” — the one who handles the finances and consequently, also catches all of the grief when a mistake is made. It’s an unfair position to put your spouse in, and one that can dissolve your marriage fast. Resentment is a powerful and very destructive force. My wife and I played that game for the first four years of our marriage. She handled the money, then I handled it; each time resulting in the blame game, and many, MANY, money fights because one of us messed up. Financial Peace taught us that if we were both involved in the process at every level – which meant we agreed on our goals and dreams TOGETHER – there was a lot less to argue about. You can’t argue about what you agreed on unless one of you broke the agreement, or in this case the budget in which case the problem is bigger than money. I am very happy to say that my wife and I hardly ever argue about money. We still argue, after all we’re normal. It’s just not usually about money. Money is one of the most common reasons people give for getting a divorce. Fix that, and your marriage has a much better chance of surviving. This entry was posted in Communication, Divorce, Family, Happiness, Marriage, Marriage Research, Relationships and tagged better financial life, better financial marriage, better marriage, debt-free, getting out of debt, happier marriage, improving marriage. Bookmark the permalink. I totally agree that money is a huge reason why couples fight, and I know I’m trying to find out ways the fiancee and I won’t fight. Of course, it’s money, there will be fights, but hopefully not that often and we can resolve it too. sarahnsh – I’ll add to what Lori said so well by saying that the biggest realization a couple can have is that neither is the “Controller General”. It takes conversation and discussion from both equally for this money thing to work most efficiently. For instance, I draft the budget — because I am a nerd like that — and then my wife looks it over making any changes she desires. Then we sit down like adults and talk about how those changes will be made so that both of us are happy. Emotionally speaking, some people are in different books when it comes to what they agree on, while others are in the same book but on a completely different page. The ideal place to be is on the same exact page where both of you understand each others’ wants and desires and have agreed to work together to achieve those common goals. Well said! While one person may be more actively involved in the finances, it definitely takes a partnership with plenty of open conversations. system. Be thankful in everything. Thanks, John. Yes, a focus on thankfulness helps a relationship in many ways. Best.